Last month we marked the 40th birthday of the CD, and it was as much an obituary as a celebration because those polycarbonate discs are fast becoming a rarity. There is one piece of technology from the CD age that is very much still with us though, and it lives on in the standard for sending serial digital audio between chips. The protocol is called I2S and comes as a hardware peripheral on many microcontrollers. It’s a surprisingly simple interface that’s quite easy to work with and thus quite hackable, so it’s worth a bit of further investigation. Don’t confuse this with the other Philips Semiconductor protocol: I2C. Inter-Integrated Circuit protocol has the initials IIC, and the double letter was shortened to come up with the “eye-squared-see” nomenclature we’ve come to love from I2C. Brought to life in 1982, this predated I2S by four years which explains the somewhat strange abbreviation for “Inter-Integrated Circuit Sound”. The protocol has stuck around because it’s very handy for dealing with the firehose of serial data associated with high-quality digital audio. It’s so handy that you’ve likely heard of it being used for other purposes than audio, which I’ll get to in a little bit. But first, what does I2S actually do? In the era of social media, events such as the fire at Notre Dame cathedral are experienced by a global audience in real-time. From New York to Tokyo, millions of people were glued to their smartphones and computers, waiting for the latest update from media outlets and even individuals who were on the ground documenting the fearsome blaze. For twelve grueling hours, the fate of the 850 year old Parisian icon hung in the balance, and for a time it looked like the worst was inevitable. The fires have been fully extinguished, the smoke has cleared, and in the light of day we now know that the heroic acts of the emergency response teams managed to avert complete disaster. While the damage to the cathedral is severe, the structure itself and much of the priceless art inside still remain. It’s far too early to know for sure how much the cleanup and repair of the cathedral will cost, but even the most optimistic of estimates are already in the hundreds of millions of dollars. With a structure this old, it’s likely that reconstruction will be slowed by the fact that construction techniques which have become antiquated in the intervening centuries will need to be revisited by conservators. But the people of France will not be deterred, and President Emmanuel Macron has already vowed his country will rebuild the cathedral within five years. It’s impossible to overstate the importance of the men and women who risked their lives to save one of France’s most beloved monuments. They deserve all the praise from a grateful nation, and indeed, world. But fighting side by side with them were cutting-edge pieces of technology, some of which were pushed into service at a moments notice. These machines helped guide the firefighters in their battle with the inferno, and stood in when the risk to human life was too great. At the end of the day, it was man and not machine that triumphed over nature’s fury; but without the help of modern technology the toll could have been far higher. You may have heard the phrase “flip-chip” before: it’s a broad term referring to several integrated circuit packaging methods, the common thread being that the semiconductor die is flipped upside down so the active surface is closest to the PCB. As opposed to the more traditional method in which the IC is face-up and connected to the packaging with bond wires, this allows for ultimate packaging efficiency and impressive performance gains. 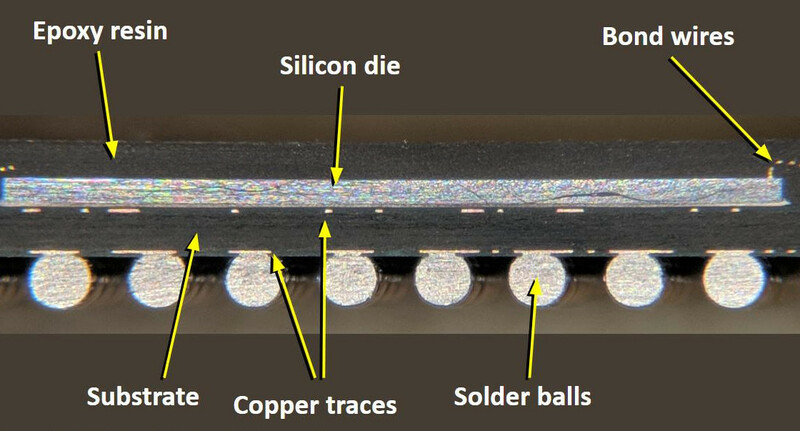 We hear a lot about advances in the integrated circuits themselves, but the packages that carry them and the issues they solve — and sometimes create — get less exposure. Let’s have a look at why semiconductor manufacturers decided to turn things on their head, and see how radioactive solder and ancient Roman shipwrecks fit in. Can you electronically enhance your brain? I’m not talking about surgically turning into a Borg. But are there electronic methods that can improve various functions of your brain? Fans of brainwave entrainment say yes. There was an old recruiting ad for electrical engineers that started with the headline: The best electronic brains are still human. While it is true that even a toddler can do things our best computers struggle with, it is easy to feel a little inadequate compared to some of our modern electronic brains. Then again, your brain is an electronic device of sorts. While we don’t understand everything about how it works, there are definitely electric signals going between neurons. And where there are electric signals there are ways to measure them. The tool for measuring electric signals in the brain is an EEG (electroencephalograph). While you can’t use an EEG to read your mind, exactly, it can tell you some pretty interesting information, such as when you are relaxed or concentrating. At its most basic we’ve seen toys and simple hobby projects that purport to be “mind controlled” but only at an incredibly rudimentary level. Brainwave entrainment is a hypothesis that sending low frequency waves to your brain can give your mind a nudge and sync up brain activity with the equipment measuring it. The ability to synchronize with the brain could yield much better measurements for a meaningful interface between modern electronics and electric storm of thought happening in your head.